FKP Smyth are a well established painting and decorating firm, the original company (K Smyth) was formed in 1960 and since its creation the current partnership has continued to provide an excellent standard of painting and decorating services to both the public and private sector. We have been nominated for several awards in relation to our work on listed buildings, and featured in the Ulster Architect journal for their work on fine art during the restoration of the Synod Hall in St Patricks’ Roman Catholic Cathedral in Armagh. Since the early 1980s the firm has been contracted by the SELB for maintenance contracts. In addition to fully meeting our obligations in respect of these contracts with the SELB, we have entered into many other separate projects with schools for painting and decorating services outside of the measured term contract. We were awarded the highly specialist contract for the restoration of the fine art work and interior decoration on the Synod hall and the main body of St Patrick’s Roman Catholic Cathedral in Armagh. 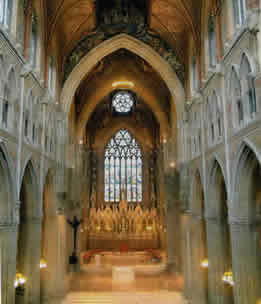 As a result of the excellent commendation by the project manager of this job, this opened another opportunity in the Church of Ireland Cathedral in Armagh, where we carried out all painting works, prior to the visit of her Majesty Queen Elizabeth of England. Our work in the home of the Dean of Armagh and in the public library in Armagh featured in a television documentary. Other prestigious contracts include the renovation of the Ara Coeli building, home of the Roman Catholic cardinal Sean Brady, and the decoration of St James’ Church in the Moy, Co Tyrone. We also were the nominated contractor in Tynan Parish Church were restoration work was carried out using our specialized equipment and craftsmen following fire damage. Our firm is adaptable and able to carry out many types of projects; both measured term or other and have an excellent portfolio of various types of work, restoration, renovation and new build projects. We have also completed painting and decoration in numerous private homes. We have a highly motivated, enthusiastic workforce, who are totally committed to providing an excellent service and take pride in every job that they undertake to do. The partners of the firm continually review all processes to ensure that we can always achieve best practice and are up to date on all courses and qualifications in relation to Health and Safety at work. We have achieved level A in the SafeTcert accreditation and we are a member of Construction line, CITB, Master Painters Federation and Building Guarantee Scheme. The Company is aware of all their obligations as led down by legislation with regard to health and safety at work, environmental issues and fair employment.